The Bulls pulled in to Columbus some time yesterday. Less a starting pitcher, but possibly with Mike Ekstrom on the way to take Jake McGee's place. I posted early yesterday, so in case you missed them, here are a couple of end-of-first-round stories. The Bulls had a tough four-game set back in July. Stories are here, here, and here. We remarked then that the Clippers were a very young team. A somber note from that matchup, the last game of that series was the game Alvin Colina tore his knee up. We haven't seen Mr. Colina since. Over at Rays Prospects Jim Donton has put together an interesting table that looks at the seasonal stats for the two teams. Steve Wiseman at the Herald-Sun has some getting on the bus quotes as the Bulls left for Columbus. Up in Columbus, Jim Massie of the Columbus Dispatch takes a look at the upcoming series. He notes the considerable turmoil in the Clippers' ranks. Closer to home, Adam Sobsey at Indy Week takes an in depth look at the lineups and makes the case that starting pitching and veteran at bats will make the difference. The International League has a six-page preview that can be downloaded from its site. I'm guessing it will also be available from the Bulls site in a few minutes as well. Nice piece of work. Not to be outdone, here at WDBB we have done some number-crunching on just the playoff games. 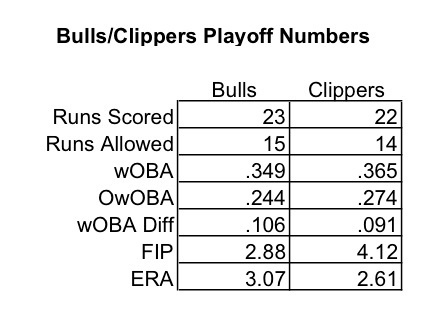 This table shows just team wOBA for the Bulls and Clippers, and the team wOBA of their opponents for the Bulls 5-game series with the Bats and the Clippers 4-game series with the Yankees. Unfortunately, about all these numbers tell you is that the teams match up pretty well. I like the fact that the Bulls difference in the wOBA is larger and I like the fact that the Bulls FIP is smaller. Here's hoping those differences translate into runs across the plate. One last point. The game starts at 6:35. Air time is 6:20 and the game is on FM 99.9 The Fan, not the usual AM 620 (But I could be wrong on that. If you don't find it on one, try the other).